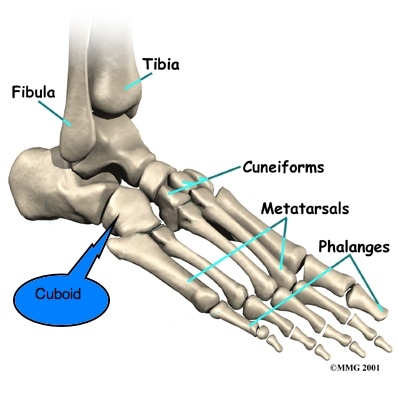 Cuboid is a bone located at the outer aspect of the foot, which connects the 4th and 5th metatarsals to the heel bone or calcaneus. This can be seen in the diagram below. Though the chances of fractures occurring to the cuboid are quite low and rare to see in clinical practice, it can still occur and sometimes be missed. It can be seen that through most of these causes, the common action that is performed to cause a fracture at the cuboid is similar to the ‘nut-cracker’ – where the foot plantar flexes (moves downwards), abducts (outwards), causing the cuboid bone to be crushed between the calcaneus and the metatarsals. This can be visually seen using the image above. This may then alter the length of the outer arch, also known as the lateral longitudinal arch, which can then change the position of the foot when weight bearing and cause long-term instability or pain. Stress fracture at the cuboid usually occurs due to athletic injuries and commonly affects the inner aspect of the bone. The bone usually fatigues and can form a small crack. Treatment does depend on the type of stress fracture that is present. This is usually determined based on physical examination and/or radiographic imaging, including X-rays. For further information and discussion on the treatment and management, please do visit your friendly podiatrist.